Tuesday 18th April 2017, 6:00 for 6:15 pm. 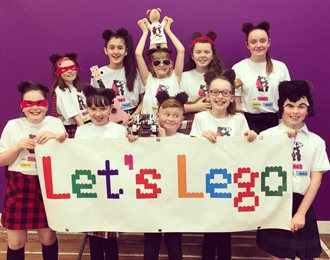 Following the keen interest shown by members at the recent First Lego League talk, the BCS will be hosting a celebration of FLL in Scotland, showcasing the prize-winning robots from three top teams from the 2017 context, plus the UK Final winners from last year. 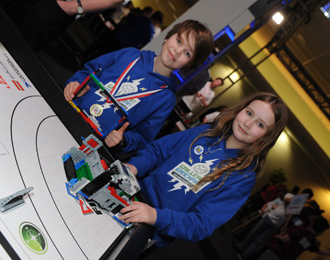 The First Lego League (FLL) is an international competition for 9-16 year olds which offers a holistic approach to learning computing. It is more than just robots -- participants also research problems and invent solutions to real-world issues such as using technology in education and helping communities recover from natural disasters. Run in Scotland by Lambda Jam and the Young Academy of Scotland with support from the BCS, FLL has impacted 2000 children across the country since 2013. The showcase will feature three Scottish FLL teams: Gailleann Eanchainn (GE) from Edinburgh, The Super Scotty Bears (SSB) from Fife, the Little Lauder Lego Legends (LLLL) from the Scottish Borders snd the West Linton Wasps. 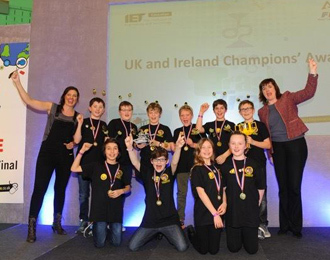 The first three are fresh from competing at the IET's UK and Ireland FLL Final where they did Scotland proud. GE narrowly missed out on making the robot knock-out rounds and SSB and LLLL both won Judges' Awards for Excellence. They are now gearing up to represent the UK at the FLL European Championships to be held in Denmark this May! 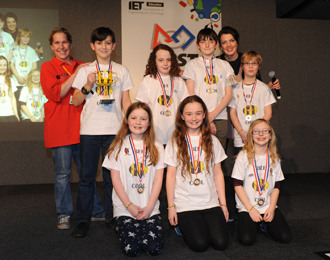 The West Linton Wasps won the FLL UK Final last year; the phone above shows MP Nicky Morgan and BBC's Fran Scott presented them with their trophy. You are invited to come raise a glass to the talented youngsters and hear how FLL has inspired them and how the BCS has supported them. Come revel in robotics as we watch how their incredible robot creations have tackled this season's intricate missions. Laura Meikle is the driving force establishing Lambda Jam, after lamenting the fact that the FLL contest stopped in Scotland many years ago. 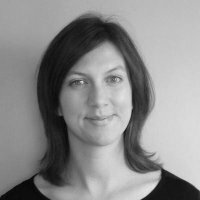 While completing her PhD at the University of Edinburgh (Informatics), she became active in science enrichment, including mathematical tours of the Royal Mile for the Edinburgh Science Festival and Informatics Open Days for schools, and saw a need for more such programmes. Laura has run Lambda Jam since 2013. Previously, she worked in positions including university-level CS course development and teaching and as a market researcher. She lives in the country with her partner, two children, nine computers, and approximately six thousand lego bricks. Professor Sethu Vijayakumar is the Director of the Edinburgh Centre for Robotics. His latest project (2016) involves a collaboration with NASA Johnson Space Centre on the Valkyrie humanoid robot being prepared for unmanned robotic missions to Mars. Sethu is a keen science communicator and in recent years, has been active in many outreach events to engage with the general public and children on all things science and engineering. He is a Fellow of the Royal Society of Edinburgh and the winner of the 2015 Tam Dalyell Prize for Excellence in Engaging the Public with Science. He was involved with the launch of the BBC micro:bit coding initiative but most people will recognize him as one of the judges on the latest series of the BBC's Robot Wars.